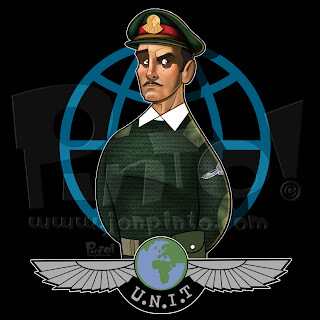 Brigadier Alistair Gordon Lethbridge-Stewart as played by Nicholas Courtney. It was always a treat for me when the Brig made an appearance in Doctor Who, especially after his run as a regular ended when the Third Doctor bowed out. He went on to meet the Fourth, Fifth, and Seventh on television and was mentioned by name in a Tenth Doctor story. He recently returned to the role in the spin off Sarah Jane Adventures. Sadly, Nicolas Courtney passed away yesterday in London at the age of 81. Five rounds rapid in honor of the Brig. When Bloom County went away and then Calvin and Hobbes, I thought I had lost the need to visit the comics section of my newspaper. I should have known that I would be lured back by a friend and former co-worker. Dan Thompson has me reading his strip every morning. It's actually the first thing I do when I wake up just before I check the weather. Granted, I get it emailed to me instead of being read in a printed paper, but I still count my digital subscription as being loyal. I love the strip! Combo adventure and comedy with great characters and great designs! I always knew Dan was a talented guy, but I never knew he had this in him. It should not be long before others more important than me take notice as well. 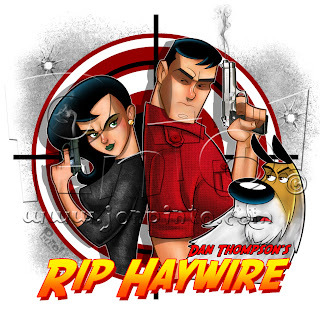 I am sure in the future we will see a Rip Haywire cartoon or movie. I can't wait. For right now I would settle for a trade-paperback collection!! So continuing the trend of "re-shaping" the Monkey Squad, here are some doodles of the smartest and largest of the gang. Augustus REALLY got a makeover. I think out of all three, he definitley changed the most. For the better I hope. 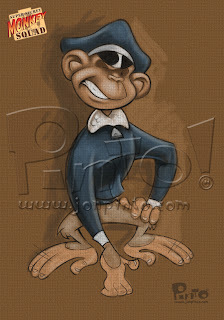 I was looking over my old drawing of the Super Secret Monkey Squad and started drawing in my sketchbook again. I felt the need to re-visit and then refine some of the shapes and such of the characters. I had a lot of fun doing it too! 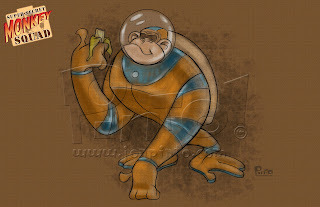 I have the first monkey to share at the moment.